Cafe Pulsation joined our Mission to help provide access to “Clean Water for All by 2030”. This Mission was initiated by the United Nations. A big thank you to Cafe Pulsation’s team and customers for joining this extremely important mission on 01 March 2018. Pulsation adds a new spark to the cafe funk of Kent Street. Though small, it boasts an extensive menu of burgers, salads and drinks, all which satisfy even the pickiest eaters with options to customise to your desire. 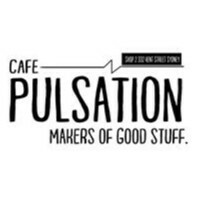 The heartwarming brainchild of two keen bean coffee lovers, Pulsation resonates with a culture of hearty yet health-conscious eating - serving real, organic items made from the freshest produce sourced from local suppliers. Having been a part of the daily corporate bustle, the couple also know the undeniable power of a robust, aromatic coffee to kick start the day. Fair trade organic beans are the core of their rich, smooth coffee. An experience to seize, Pulsation invites you into its cosy home at 332 Kent Street to revitalise, refill and rejoice in good food.